The first weekend back for students proved to be a successful one for Pitt sports. While the men’s soccer team dropped its season opener, the women’s volleyball and soccer teams picked up the slack by going undefeated through the opening weekend of the fall sports’ season. 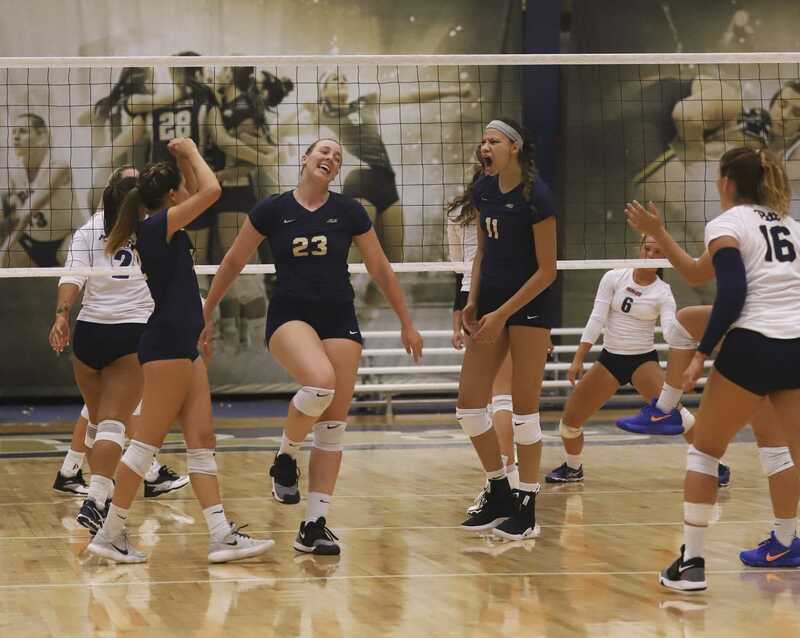 Pitt volleyball proved why it was ranked No. 1 in the ACC preseason coaches’ poll when it went 3-0 to win the Panther Classic at the Fitzgerald Field House this weekend. The Panthers finished the weekend with 147 kills, 11 aces, 29.5 blocks and 143 assists, while only losing one set to go 7-1 on the weekend with two sweeps. Sophomore Kayla Lund was named to the All-Tournament team, recording 42 kills on the weekend. She led the Panthers in kills in two of their three games, while also recording five aces and 32 digs. Pitt juniors Layne Van Buskirk and Nika Markovic were also All-Tournament selections. Pitt’s first win came in a sweep against Butler. In two of the three sets, the Panthers held the Bulldogs to fewer than 15 points and dominated in every category. Pitt finished with 44 kills on 84 attempts and five aces. Van Buskirk led the offense attack with 13 kills and five aces. Lund finished right behind her with 10 kills, two aces and two blocks. The Panthers then turned around and beat their first ranked opponent since the 2016 NCAA Tournament later that night, when they knocked off No. 24 Cal Poly 3-1. Cal Poly came out fighting and won the first set 25-22 after jumping out to an early 10-2 lead. But Pitt didn’t let the Mustangs’ lead last long and bounced back to win the next three straight sets, not allowing Cal Poly to score more than 19 points in any game. Lund was once again one of the forces behind Pitt’s offense, recording 20 kills, one ace and one block in the match. Pitt’s last win of the weekend came in a three-set sweep against Pepperdine. The Panthers recorded 42 kills, three aces, 11 kills and 42 assists in their 25-23, 25-20, 25-13 victory. Lund led once again, recording her second double-double of the weekend with 12 kills and 12 digs. Pitt volleyball will return next weekend when it competes in the Seton Hall Classic in South Orange, New Jersey. The Panthers’ first game will be Friday against Oklahoma. Only nine days into the 2018 season, Pitt women’s soccer has already matched its number of wins from last season. Under the direction of first-year head coach Randy Waldrum, the Panthers tied Kent State 1-1 and beat Jacksonville 2-1 at Ambrose Urbanic Field this weekend to remain undefeated and improve to 3-0-1 on the season. Pitt took the lead early against Kent State when first-year Anna Rico scored her third goal in three straight games in the 16th minute on a pass from sophomore Dixon Veltri. Waldrum praised Rico for carrying Pitt’s offense in an interview with the athletic department. Kent State tied the game in the 53rd minute on a goal from sophomore Maddie Holmes when converting a corner kick. Despite two overtimes, neither team was able to find the net again — largely thanks to redshirt sophomore goalie Amaia Pena, who ended the game with six saves. Waldrum made some changes in Pitt’s game against Jacksonville on Sunday. He moved sophomore Aideen O’Donoghue to a forward position in hopes of finding someone besides Rico to score goals. O’Donoghue proved herself 17 minutes into the first half when she scored her first career goal and gave the Panthers a 1-0 lead. The lead didn’t last long and Jacksonville scored two minutes later to tie it up going into halftime. Veltri started the turn around when she scored her first career goal off the crossbar to give the Panthers the lead and the eventual win. Pitt recorded 14 shots in the game but was able to limit Jacksonville from four shots in the first half to only two shots in the second half. The women’s soccer team’s next game is on Thursday, when it travels to Texas to play TCU. Despite leading in shots, shots on goal and corner kicks, Pitt men’s soccer lost its first game of the season 1-0 against Colgate at Ambrose Urbanic Field on Friday. After a long defensive battle in the first half that kept both teams from taking a shot for the first 17 minutes of the game, Colgate senior forward Freddy Jonsson scored the first and only goal of the game 73 minutes in. Pitt’s head coach Jay Vidovich told the athletic department he thought this game was a good starting point for his team. Pitt outshot Colgate 9-4 in the second half of the game, forcing Colgate’s junior goalkeeper Jacob Harris to make four saves. The Panthers’ offense was led by sophomore Edward Kizza, who had five shots — including four on goal. Sophomore Alexander Dexter and redshirt freshman Fiorre Mane both contributed two shots. Vidovich singled out the underclassmen gaining experience as another high point. The men’s soccer team will be back in action Monday for an away game against Delaware.